Home is a powerful word. It means that safe space we come back to, that place where we are ourselves, where we feel we are in the right place, our place in the world. The saying “home is where the heart is,” means not only does our home hold a close spot in our heart, but home is essentially on the inside, where it counts. One can feel at home in the company of a loved one, or at their favorite bench in the park – the word can span across so many places and mean many different things to different people. Why do I bring this all up? I want to introduce you to my home, or one of them anyway. It is a place I go and I can just be. It is a place of comfort, a place I feel more myself, more settled in my skin. It is called The Book Barn. The Book Barn is in Niantic Connecticut, about an hour’s drive from the Uconn Storrs campus, and it is so much more than a used bookstore. For one, most of the shelves are outside. Winding around in a labyrinth of cases and old bindings, you travel from station to station – mystery to romance, to the end of the line where less popular books are housed, such as travel guides or dog-training books. But to get there one must pass through a real treasure trove of old novels from every author, every genre, every date. Adding to the magical charm are statues and gardens, inhabited by an undetermined but plentiful amount of roaming cats. With benches and tables scattered throughout, one can spend an entire afternoon strolling through the book forest, picking up whatever they fancy and reading late into the afternoon. The place, at least to me, is idyllic. The Book Barn is also good at what it does – the books sold there are not falling apart, not written in, not useless or unloved. For a real book collector The Book Barn is a dream – the oldest, more rare piece are housed indoors by the register, and the collection is not small to say the least. I am gushing at this point, but where else can one gush about a place so attuned to the literary mind? If you are in doubt, check out the website, or go visit to see for yourself. 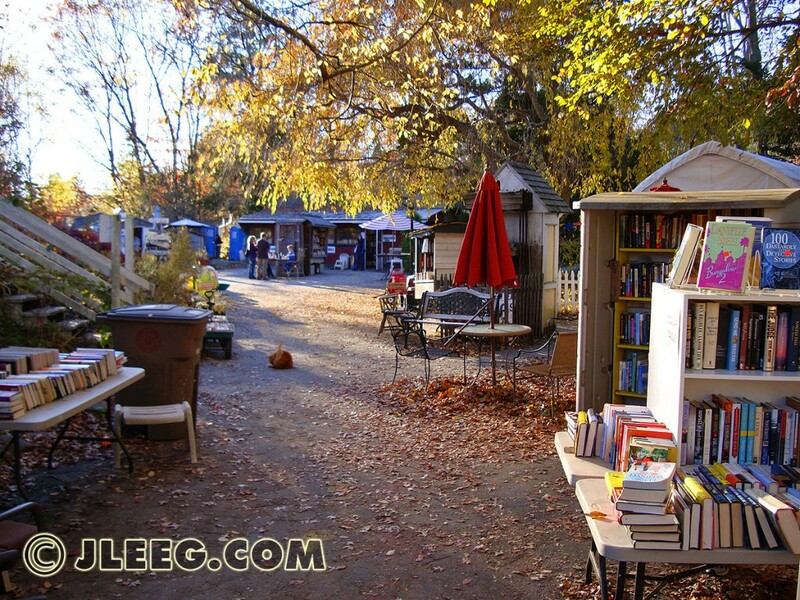 You won’t be disappointed – The Book Barn is not just a barn of books, that’s for sure.